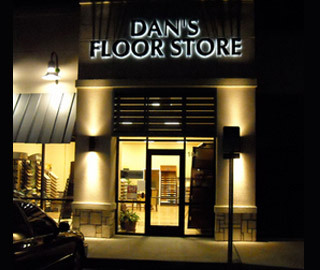 Contact Dan’s Floor Store 904.887.8303 for a free consultation and estimate to restore and refinish your wood floors. Some worn or damaged wood flooring can be restored with sanding and refinishing. Sanding, staining, and refinishing wood floors can give them a whole new look without the cost of replacing that wood flooring. Based on years of wood floor refinishing experience, all of our wood floor refinishing projects begin with a full survey of all floors to be refinished during the job. The condition of each floor is different. We observe and note any areas that will need special attention. This quick video will give you an idea of how Dan’s Floor Store refinishes hardwood floors. 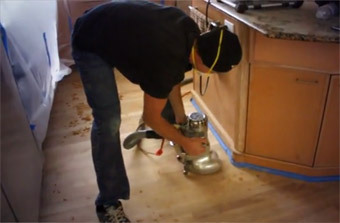 Our Floor Refinishing process begins with the “cutting” phase, during which we sand the wood flooring. When fine sanding is completed, we scrape the corners and around the door casings by hand to remove any ridges. Next we thoroughly vacuum the floors to remove any sanding grit or sawdust left behind. Clean floors result in a better flooring finish. If our client would like their wood flooring stained, stain application follows, and the stained floor is allowed to “rest” so that the stain soaks into the wood fibers. Following staining, the finish is applied to the wood floors. We often use polyurethane finish because it is attractive and durable. We apply polyurethane in three coats, slightly roughing and then vacuuming the surface of the first two coats, prior to installing the next coat, to create a better adhesive bond between the coats of finish. We have had the pleasure of restoring many wood floors; renewing them for years to come. You can see photos of some of our completed refinishing projects in our Gallery. 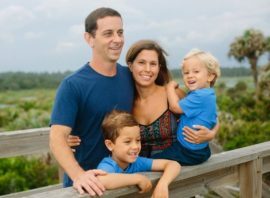 Whether you live in Jacksonville, Atlantic Beach, Jacksonville Beach, Neptune Beach, Nocatee, St. Augustine, Fleming Island, Palencia, Eagle Harbor, Ponte Vedra, Springfield, San Marco, World Golf Village, or one of the other communities in Northeastern Florida, or own a business in one of these areas, we look forward to working with you to provide the wood floor refinishing you need for your home or business. Get the quality and the look you want, with friendly service and reasonable prices. Visit our Ponte Vedra, Florida showroom. Call Dan directly at (904) 887-8303. Call the store at (904) 825-2311 to speak with our salesman or to make an appointment for a Free in-home consultation and estimate. Whether you live or work in Jacksonville, Atlantic Beach, Jacksonville Beach, Neptune Beach, Nocatee, St. Augustine, Palencia, Ponte Vedra, Ponte Vedra Beach, South Ponte Vedra Beach, World Golf Village, or one of the other neighborhoods in Northeastern Florida, we look forward to working with you to provide the hard surface flooring you need for your home or business.